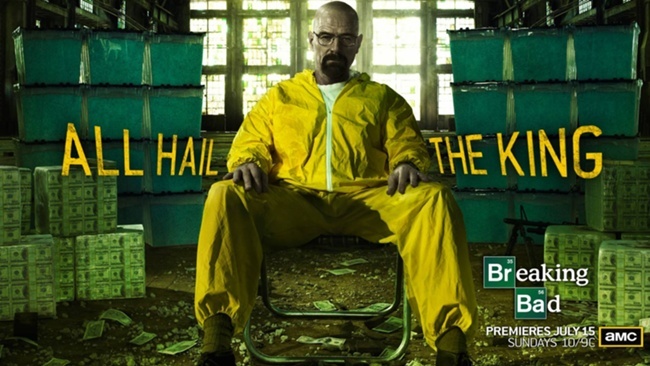 The last show of the Breaking Bad series is called: Felina. There are several observations I’ve seen made about this title. 1) It’s a song title. 3) If you take the letters, Fe, Li, Na. That’s Iron, Lithium, and Sodium. That’s an ingredients list. Iron is in blood, Lithium is in meth, and Sodium (salt) is in Tears. Blood, Meth and Tears. Not sure which of these are which, or even if they were intentional, but man, I hope number 3 was. 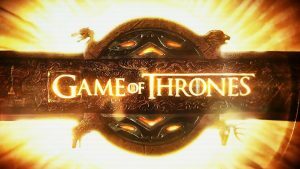 It’s been a while since I’ve written one of these “theory” posts about a show. After watching the season finale of Breaking Bad, “Gliding Over All”, I decided to write what I thought about it, and where I think things might be heading. First off, how great was that scene where Skyler saw Walt staring at that blue water in the swimming pool, mirroring Walt looking at all that blue meth all the time? Seems like there is always some kind of huge explosion in the finales. Planes crashing, rooms getting blow up… and now, a figurative “blow up” – Hank seeming to figure out that Walt might be “Heisenberg”. I say seemingly, because while Hank might think that, he can’t come right out and do anything about it, because he still has to prove it. Now, from watching all the episodes so far, we know that Walter is really, really smart, and has previously set things into motion to make sure that all the parts move the way he wants. Walt set up the kid in last year’s episodes to get poisoned, knowing that he’d keep Jesse completely out of the picture while he dealt with Fring. Knowing that, I have to think about what Walt was planning, when he said he was “out”. What did Jesse and Mike have to do? Jesse could just walk away (more on this later). Mike had the DEA following him, so he had to make sure that his guys were paid off, and have a “go bag” ready in case he had to leave. A lot more complicated than what Jesse had to do. What about Walt? Walt has a LOT more to deal with, and really just can’t walk away. He’ll have to deal with the guy who was was distributing for him, and who wouldn’t be too happy if he quit. He’ll have to deal with Lydia and Todd, who both know his identity. There is Todd’s uncle and his “friends” who would go looking for Walt if anything bad happens to Todd. And there’s the crew with the fumigation company. And there’s Saul too. The Mexican cartel that is probably still very upset about The Cousins being killed, and I’m sure they’d love to get their revenge too. I’d also imagine that the Cech Republic cartel that Lydia has been supplying might want to know what’s up when the supply dries up. Walt’s a smart guy. He knows he can’t just walk away like that. He has to realize that he has do something to make sure he is safe from all these people, in case one of them turns against him. But what can he do? He can’t really hire more people, because he would want to eliminate witnesses, not create more. So, who can he get to do that for him? The only group of people I can think of would be the Hank and his people at the DEA. That’s the reason I suspect that Walt planted that book in the bathroom, knowing there was a possibility of Hank finding it. Walt can’t come right out and ask the DEA for help without having it all blow up in his face (sorry, Gus, I had to say that). The best thing Walt has going for him right now is that it would be hard for anyone on the outside to believe that Walt is “Heisenberg”, a major criminal mastermind. Even with the book, Hank only has circumstantial evidence. He’d have to put surveillance on Walt. I think if Walt realized this, he would be able to create a lot of situations where the DEA found out about the other operators, but left him with some plausible deniability. There’s really no evidence in Walt’s house about what he’s been up to, other than the small dose of poison that he keeps behind the wall outlet. (And that’s one thing Jesse better never find out about, because he’ll make the link about what happened immediately). So that’s the real question. Is Walter already one step ahead of Hank, or is he going to do a lot of fancy footwork to get out from what’s arguably the very toughest situation he is about to find himself in? Either way, I think Walt’s best hope of survival is the DEA, so we’ll see. The final season, season 6, can’t come soon enough.